To fully appreciate the nuances of FUSE spectra and to extract the maximum information from them, a familiarity with these issues is essential regardless of the users expertise level ("Casual", "Intermediate" or "Advanced"). In this chapter, we discuss these effects, and how to recognize and deal with them. Airglow is always present to some degree since there was no instrument shutter. Since airglow is a diffuse source, it is strongest in the LWRS and weakest in the HIRS (Figure 4.4). Because airglow is caused by solar excitation of the Earth's upper atmosphere, it is far stronger during orbital day than night. The actual degree of airglow contamination in any particular spectrum will depend on a variety of factors, including the fraction of the observation obtained during orbital day, the orientation of the satellite (which determines the path length through the Earth's atmosphere), and the phase of the solar cycle (which influences the degree of excitation of airglow lines and the extent of the atmosphere). The strongest airglow lines in the FUSE range are listed in Table 7.1, and a full discussion of the FUSE airglow spectrum can be found in Feldman et al. (2001). Figure 7.1 shows a comparison of all the data (black trace) versus data obtained during the night-only portion of the observation (red trace) in observation A1330121. The upper panel displays the range where damped H I Lyβ absorption occurs ( ∼1025 Å) in the LiF1A segment. The emission arising at the center of the line is due to airglow contamination by the same atomic species. The bottom panel displays absorption caused by the N I triplet ( ∼1134 Å) using all the data (black trace) and the night-only data (red trace). Figure 7.1: The difference in the degree of airglow contamination between "day + night" spectra and "night-only" spectra of an O4 supergiant in the LMC. This observation (A1330121) was obtained through the LWRS aperture in TTAG mode. The integration time was divided approximately equally between orbital "day"d "night." Top: Note the greatly decreased airglow contamination from Ly β and the O I λλ 1025.76, 1027.43, 1028.16 Å triplet in the "night-only" spectrum. Bottom: Airglow emission partially fills in the interstellar lines of the N I λλ1134.17, 1134.42, 1134.98 Å triplet. If not recognized, this contamination would lead to erroneous inferences concerning N I along this line of sight using these lines alone. Note also that because the airglow emission is extended, the astigmatism correction applied is inaccurate. This effect is always present to some extent. The only EUV solar emission lines strong enough to appear in second order arise from neutral helium. These lines are, in order of decreasing strength: He I 584.33, 537.03 and 522.21 Å, which would appear faintly at twice their actual wavelength. In addition to airglow lines, scattered solar emission lines appear in the SiC channels when the observations are taken at high β angles (i.e. angle from anti-sun direction) during the sunlit portion of the orbit. The strength of these features also depended on the spacecraft roll angle. When FES A was used, SiC2 was rotated towards the Sun, so scattered light was stronger in these data. Emission from solar-scattered C III (977.0), O VI (1031.9 and 1037.6 Å), and Lyman β (1025.7 Å) has been positively identified. Emission from N III (991.6 Å) and N II (1085.7 Å) may also be present. It is believed that the solar light is scattered off reflective, silver coated Teflon blankets above the SiC baffles. At low β angles, the solar emission disappears because the blankets are in the shade of the SiC baffles and open baffle doors and the radiation strikes the blankets at a high angle of incidence. It is unknown at which β angle, if any, the solar emission completely disappears. The LiF channels are permanently located on the shadowed side of the spacecraft and therefore the solar emission lines will not be present in LiF data. Consequently, C III and O VI emission lines observed in SiC during orbital day should always be compared to emission in the LiF channel or to observations taken during orbital night to diagnose this effect. From the failure of the third reaction wheel on 27 December 2004 until the end of the mission, FUSE mission controllers used non-standard roll angles to improve spacecraft stability. These angles could greatly increase the scattered sunlight in one or both SiC channels. When present, the scattered light, mostly Lyman continuum emission, appears as an increase in the background at λ 920 Å, and as strong, resolved Lyman lines at longer wavelengths. If one is concerned about the origin of an emission line in a FUSE spectrum, there are several precautions that can be taken to determine whether it is from the target or a diffuse source. First, be familiar with the normally expected airglow lines, and be aware that they are always brightest for observations obtained during the daytime portion of the orbit. Thus, comparing day and night spectra can reveal airglow lines (see Figure 7.1). The second order solar spectrum does not behave in the same way. Nevertheless, like airglow, it fills the aperture. Therefore, on a spectral image constructed from the IDF file, it will extend beyond the region of the detector occupied by the point source spectrum. Finally, the scattered sunlight (see below) is observed only in the SiC channels during orbital day. Thus, comparing a SiC daytime spectrum with an overlapping LiF channel spectrum or a night time SiC spectrum should identify it. It is important to differentiate between stray light and grating scattered light. Stray light is defined as light falling on the detector from a source other than the optical system, whereas grating scattered light is defined as out-of-band light that the grating scatters into the FUSE bandpass. Stray light has been seen on segments 1A, 1B, and 2A. On these segments it is seen as a vertical band running the full height of the detectors (see Figure 7.2). The brightness of these stray light bands varies during an orbit and analysis showed that the variation matches the variation of the airglow lines. Therefore, it is likely the bands are stray airglow emission (most likely Lyman α) entering the spectrograph cavity. On average, the stray light stripe on segment 1A produces about 1 count s -1 cm -2. Figure 7.2: A portion of Segment 1A showing the stray light band in an airglow spectrum. Note the pattern of alternating bright and dark arcs. LiF Lyman β is on the upper left and SiC Lyman β is on the lower right. The greyscale has been reversed so that darker shades of grey represent more counts. The preflight requirements for scattered light from the FUSE grating were very strict: the amount of light scattered into the FUSE bandpass from bright lines outside the band should be less than the detector background. The as-built FUSE holographic gratings exceeded this requirement, but the scattering is not completely negligible. This scattering is predominantly in the dispersion plane, so the normal background subtraction performed by CalFUSE will not remove it. The result is that the flux level will not quite be zero even in the bottoms of black resolved absorption lines. The scattering of light by the gratings effectively leads to very long tails on the LSF, that extend for hundreds of Angstroms. The amount of scattered light present in any given spectrum is the convolution of this extended LSF with the stellar spectrum, the reflectivities of the mirror and grating, and the detector quantum efficiency. The KBr photocathodes on the FUSE detectors are sensitive far beyond the edge of the FUSE bandpass, so the scattering cannot be accurately estimated from FUSE data alone. However, reasonable estimates can be obtained. It is rare for the absorption lines of interstellar atomic gas to be broad enough for the profiles to be resolved and flat-bottomed. The HI Lyman lines are broad enough for some lines of sight, but geocoronal emission is often present, making it difficult to be sure that grating-scattered light is the primary contributor to flux at the bottoms of the lines. Molecular H2 absorption provides an ideal means of measuring grating scatter: for lines of sight with a large column density of H2, there will be numerous absorption troughs many tenths of an Angstrom wide distributed over 912Å to 1110Å. Figure 7.3 shows an example of the residual flux in such lines. Figure 7.3: A small region of the LiF2B and SiC1A spectra from P1161401 is plotted, showing saturated H2 absorption. The lower panel gives a magnified view showing the difference in the scattered flux in the two channels. Table 7.2 gives the ratio of residual flux at the bottom of the H2 absorption troughs to an estimated mean continuum, for six detector segments in each of five observations. The spectra were obtained through the LWRS aperture, except for P3020701, which used MDRS. The P3020701 observation also differs from the others in that the continuum is essentially flat across the FUSE waveband, while the continuum flux declines by a factor of several towards shorter wavelengths in the other observations. The general trend is that the LiF channels exhibit less residual background than the SiC channels, though SiC2B is close to LiF1A. 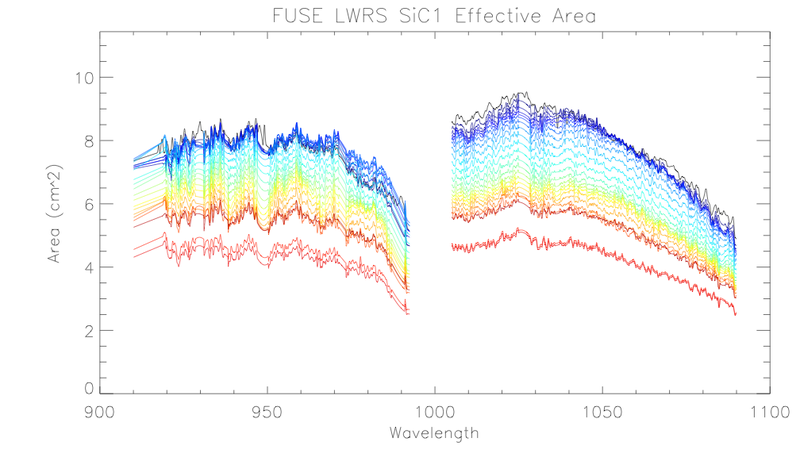 For both SiC1 and SiC2 LWRS data, the short-wavelength segment shows markedly higher residual background flux than the longer-wavelength segment. This trend is not present in the P3020701 observation, however. To test whether this is the result of an artifact in the background subtraction, particularly for SiC1, for which the spectra are located close to the edge of the detector, or the result of the residual flux being dominated by scattering of much higher continuum flux at wavelengths beyond the individual detector segments, the flux ratio was also computed with respect to the flux at 1150Å instead of the local continuum. The results are in Table 7.3. Scaling the fluxes relative to that at 1150Å does improve the consistency between detector segments for the SiC channels, though only for the LWRS data. The MDRS residuals remain considerably higher than for LWRS, suggesting that scattering from the edges of the aperture may be significant. Occasionally, the FUSE detectors register large count rates for short periods of time. The phenomenology of the bursts have been characterized but their cause has remained elusive. These event bursts can occur on one or more detectors at the same time and often have a complex distribution across the detector (see Instrument Handbook (2009)). Typical bursts last for about 1 min, though durations from 1 s to 10 min have been seen. Event bursts have been seen on all 4 segments, though they are most common on segments 1A and 1B. CalFUSE screens the data to identify and exclude bursts for TTAG data only (Dixon et al. (2007)). It does this by sampling the background count rates in selected regions of the detector and rejecting time intervals in which the background rate rises rapidly, as when an exposure extends into an SAA or the target nears the earth limb. The background rate computed by the burst-rejection algorithm is stored in the BKGD_CNT_RATE array of the timeline table and included on the count-rate plots (*rat.gif) generated for each exposure. Event bursts are usually inconsequential for HIST data because the target count rates are so high. The portion of the TTAG data screened out due to burst events can be seen in the file generated for each exposure (see Figure 4.3). Observers should still examine their raw data to determine if event bursts occurred during the exposure and if they were properly removed, especially when working with data obtained for faint targets. Ancillary data, such as the count rate plots, may also be useful for this assessment. Strong fixed-pattern noise has been reported especially in HIST spectra of bright sources. It is strongest in segment 2B but has been seen in segments 1A and 1B as well. This noise is due to beating among the arrays of micro-channel pores in the three layers of the Microchannel Plate (MCP) stack (Tremsin et al. (1999)). On the detector, the moiré pattern appears hexagonal (see Instrument Handbook (2009)), but in extracted HIST spectra it appears as high-frequency fringes as shown in Figure 7.4 (see also Dixon et al. (2007)). When present, users are advised to smooth or bin their spectra by ~8-10 pixels to average out the effect. Figure 7.4: Fixed pattern noise due to moiré structure in the SiC1B HIST data from target HD 22136 (program Z9011501). The moiré ripples are strongest in segment 2B, but are also seen in segments 1A and 1B as shown here (see also Dixon et al. (2007)). Associated errors are overplotted in red. The upward peak is due to H I airglow emission. Two grids of fine wires partially shadow the active area of the detectors (see Instrument Handbook (2009) for details). Their interaction with the horizontal focus of the spectrograph produces shadows on the detectors known as "the worm" (or more generally "worms" since they appear in multiple channels). These shadows can attenuate up to 50% of the incident flux and vary as a function of wavelength. Their location changes in the dispersion direction depending on the vertical position of the source in the aperture. Since the location of the focus point is wavelength-dependent, the strength of the worm is sensitive to the exact position of the spectrum on the detector. This position cannot be determined reliably enough to automatically compensate for the flux loss due to worms. Hence, worms are not corrected by CalFUSE. Worms have been seen in all segments but they are most prevalent in the LWRS LiF1B segment. Figure 7.5 illustrates the effects of the worms on FUSE data. The redundant wavelength coverage of the FUSE channels can be used to diagnose and potentially mitigate the effects of the worms (see Figure 7.10 to 7.12). Observers who require absolute spectrophotometry should carefully examine FUSE spectral plots for the presence of this effect. 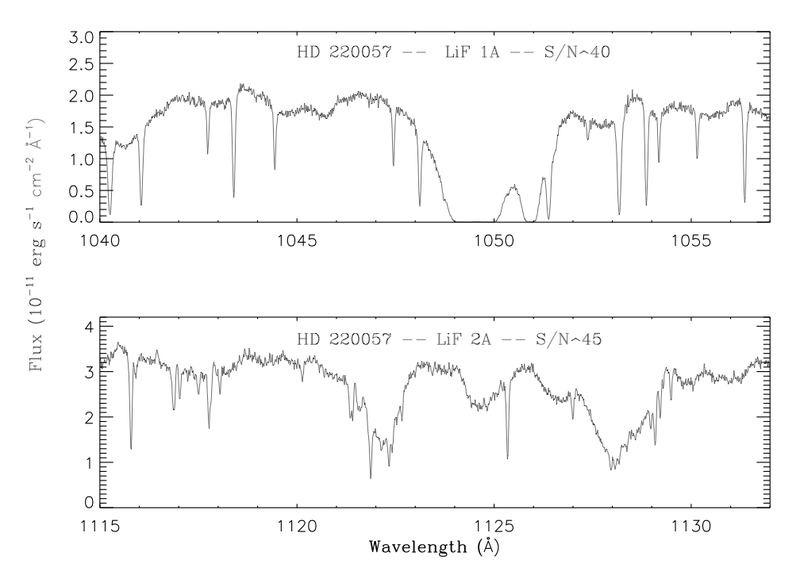 Figure 7.5: LWRS point-source spectra obtained with the LiF1B (spectra A and B taken at different vertical positions) and LiF2A (spectrum C) segments. The large depressions occuring around 1145 Å in spectrum A and 1160 Å in spectrum B are due to worms. Note that spectrum C is unattenuated in this particular case (see Dixon et al. (2007)). Dead zones appear as opaque spots on the detector image. They are small regions on the detector where the sensitivity is truly reduced. Type I dead zones are simply regions of decreased sensitivity. Type II dead zones, in addition to showing a loss of sentivity at the center of the spot, also exhibit bright rims around them. Discussion of the origins of this rim can be found in the Instrument Handbook (2009). Unlike Type I dead zones, Type IIs have been seen to vary in size and shape with high-voltage cycling. Both types of dead zones are difficult to correct but are noted by their QUALITY flag in the extracted spectral file. In cases where the dead zone is smaller than a single resolution element (most cases), masking the region out of the spectral extraction is sufficient. However, the larger features will affect the quality of extracted spectra. Observers are advised to examine the IDF files (using the cf_edit.pro tool described in the FUSE Tools in C package, for instance) for the presence of dead zones to avoid confusing these artifacts with real absorption lines. A comparison between spectra from channels with overlapping wavelength ranges is also recommended, as is shown in the right panel of Figure 7.6. The left panel displays the IDF file for that same exposure. Figure 7.6: Left: Data from the IDF file for segment 2A of exposure D0640301002 obtained by observing target HD 91597 in LWRS. The cf_edit.pro routine (see Chapter 8) was used to display this IDF file and shows the full spectra displayed in the bottom panel of the plot. The top panels show the presence of a Type I dead zone in the SiC2A segment around 997 Å. This plot displays reversed colors where absorption features appear as bright stripes against the dark continuum emission. 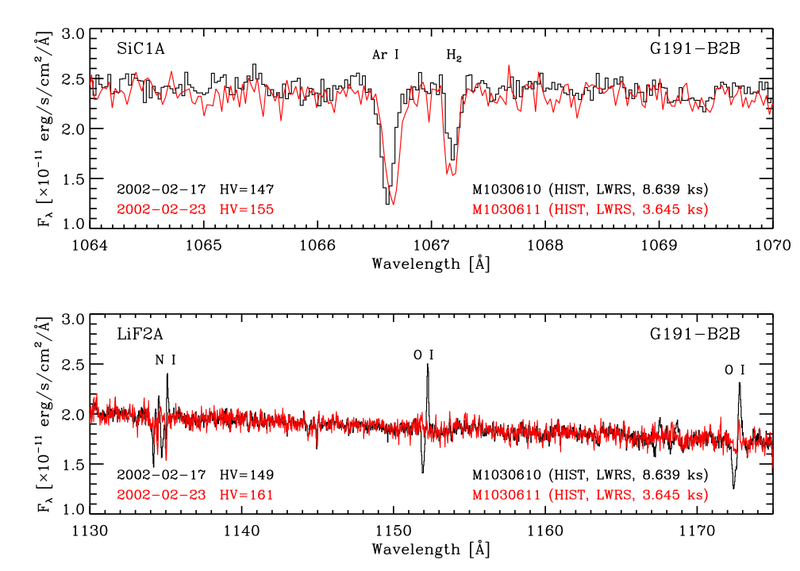 Right: A comparison of the extracted spectra from segment SiC2A (black trace) and LiF1A (red trace) over their overlapping wavelength range for target HD 91597. In SiC2A, the strong absorption feature around 997 Å is spurious and due the presence of a dead zone at this particular detector location. Note its absence in the LiF1A spectrum. The FUSE detectors convert each ultraviolet photon into a cloud of electrons, for which the detector electronics calculates the X and Y positions and the intensity, or pulse height. Prolonged exposure to photons caused the detectors to become less efficient (a phenomenon called gain sag), and thus the mean pulse height slowly decreased with increased exposure. Unfortunately, the X location of lowest pulse-height photon events is systematically miscalculated by the detector electronics. As the number of low pulse-height events increases, spectral features appear to "walk" (or shift centroid) across the detector. The effects of the walk vary as a function of both pulse height and position on the detector. A common example is the shoulder apparent on the short-wavelength side of the Lyman β airglow line in the LiF1A channel. To combat this problem, the detector high voltage was periodically raised. Table 7.4 lists the HV settings and the dates that they were in effect for each detector and segment. (Note: these digital HV settings are the values a user will see in the file headers, but are not actual voltages. See the Instrument Handbook (2009) for more information.) While the CalFUSE pipeline largely is able to correct for the walk in TTAG data, for which the pulse height of individual photon events is recorded, the correction applied to HIST data is only approximate. Line locations and equivalent width measurements are likely to be in error on segments affected by the walk, so results should be carefully compared to data from other segments when possible. Figure 7.7 shows the effect of the gain sag and subsequent walk on observations taken before (upper panel) and after (lower panel) raising the high-voltage in 2002. Users interested in specific HIST data are advised to compare the observation dates against those listed in Table 7.4. Note that segment 2A was below its ideal voltage after late 2002 due to problems in raising the voltage on this segment. More information can be found in the Instrument Handbook (2009). a Attempts to raise the high voltage on segment 2A in 2002 led to repeated detector shutdowns. Stable opera tions were possible only by keeping the high voltage at a lower than ideal level. Hence, walk effects will be most significant for segment 2A. Figure 7.7: The effect of gain sag and walk is illustrated in spectra of the photometric standard G191-B2B taken immediately before and immediately after the largest change in detector high voltage. 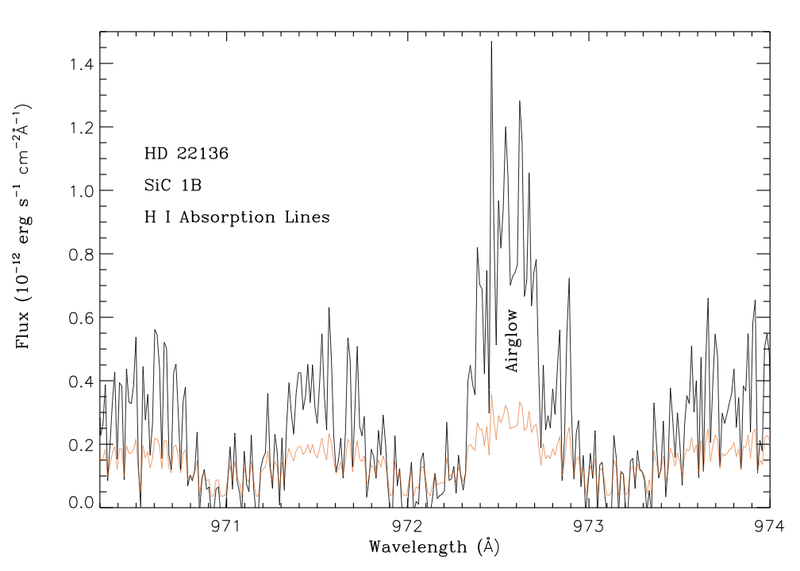 Top: Although the S/N is different in the two spectra, notice how walk subtly shifts the position and shape of the prominent interstellar absorption lines. Bottom: The narrow "P Cygni" morphology of lines in black is a diagnostic of gain-sag in regions of the detector that have been heavily overexposed. In this case, the over-exposure is quite localized due to the presence of strong airglow lines of N I and O I. Gain sag in these regions causes the positions of photon events to be misregistered, which produces the tell-tale morphology. Raising the high-voltage compensates for the gain sag, and the strange morphology disappears. However, only a crude walk correction is available for HIST spectra. The correction for these effects is much better for data obtained in TTAG mode. The FUSE detectors are affected by fixed-pattern noise - see Instrument Handbook (2009). The astigmatism (large Y height) due to the instrument's optics as well as spectral thermal motions (in both X and Y) partially mitigate this effect, but signal-to-noise (S/N) ratios above 30 could not be obtained unless something specific was done to further smear out fixed-pattern noise. To do so, an observational technique called Focal Plane splits (FP splits) was used. This technique consisted in taking a series of exposures at several FPA X positions, hence, shifting each exposure's location in the dispersion direction on the detector. If the S/N ratio obtained at each FPA position was high enough, combining all data averaged out the noise and allowed the user to reach S/N higher than 30 in the combined spectrum. Note that CalFUSE does not automatically combined those data. It is left to the user to perform the appropriate coaddition to reach the highest S/N. Figure 7.8 displays a portion of the LiF1A (top panel) and LiF2A (bottom panel) spectra obtained for target HD220057 using the FP split technique. In both segments, S/N ratios of 40 or above were reached. Figure 7.8: Use of FP splits to achieve S/N ratios above 30. Top: Portion of the LiF1A spectrum for target HD220057. These observations used the FP split technique in order to achieve S/N ratios ~40. 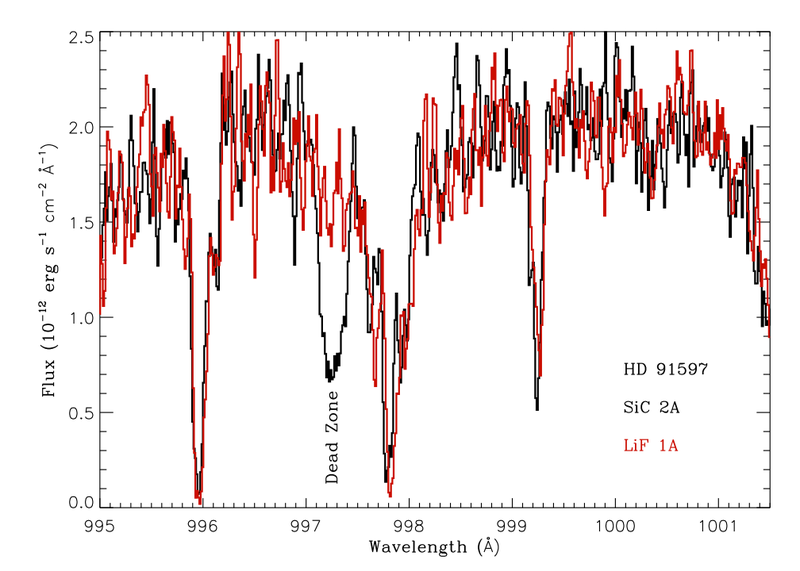 Most sharp absorption lines are due to the presence of molecular hydrogen (H2 Bottom: Portion of the LiF2A spectrum for target HD220057. Most sharp absorption lines are due to the presence of C I, corresponding fine-structure lines C I* and C I** and Fe II. The broader features have a stellar origin. The position of a target image on the detectors can vary significantly due to the exact positioning of the target in the aperture and to movements of various optical components and the spacecraft itself. The exact position of the spectra must be determined to perform proper wavelength and flux calibrations. A brief description of these various motions is given below. More details can be found in Chapter 2 and the Instrument Handbook (2009) and Dixon et al. (2007). Grating motions: are induced by small thermal variations of the gratings on orbital, diurnal and precessional timescales. These motions can shift the target by as much as 15 pixels (peak-to-peak) in both the Xand Y directions in LiF. They affect the SiC channels the most since these channels alternately see direct sunlight (or not) around the orbit. For TTAG data CalFUSE applies a grating-motion correction to each photon in the event list. Because all photons in HIST data are given the same arrival time, all the photons in an exposure receive the same grating-motion correction. Focal Plane Assembly (FPA) motion: FPA motions in the X direction are used to correct for mirror misalignments and to perform FP splits (see above). FPA motions in the Z direction are used to place the apertures in the focal plane of the spectrograph. Both motions change the spectrograph entrance angle, shifting the target spectrum on the detector. Spectral features show considerable curvature parallel to the dispersion direction and significant astigmatic height perpendicular to this direction (see Figure 7.9). These distortions are a natural consequence of the FUSE optical design. Astigmatism corrections were derived from observations of the central star of the Dumbbell Nebula (M27). Because astigmatism corrections have been derived only for point sources, no correction is performed on spectra of extended sources, airglow spectra, or observations taken with the target at the RFPT. 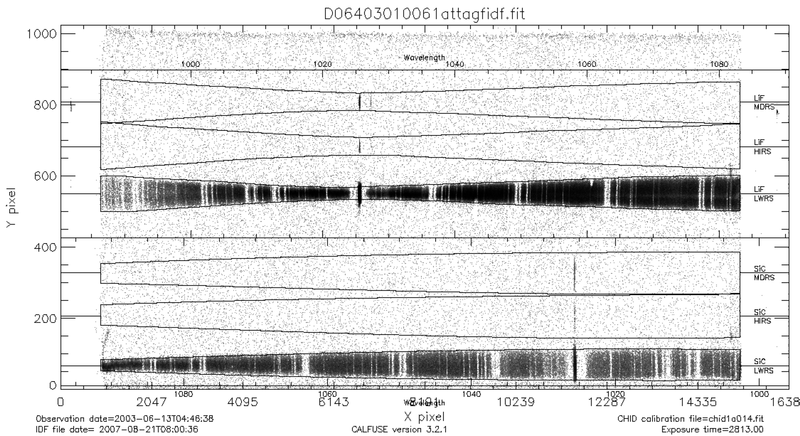 Figure 7.9: Left: Data from the IDF file for segment 1A of exposure D0640301006 obtained by observing target HD 91597 in LWRS. The spectral line curvature and their variable heights induced by astigmatism are obvious in LiF1A and SiC1A spectra. Note that colors are inverted so that absorption features appear as bright stripes. Right: Image (*ext.gif) of detector segment 1A once the data for exposure D0640301006 have been fully corrected for astigmatism, detector effects and other effects described in this Chapter. The major issues that affect the absolute flux calibration of FUSE data are target motions on the focal plane, which tend to affect the overall normalization of the entire spectrum from a channel, and "worms" which affect specific spectral regions (see Section 7.3.2). The FUSE flux calibration is defined by synthetic spectra of six hot DA white dwarfs. The six stars include the four DAs used as primary standards for HST: GD71, GD153, HZ43, and G191-B2B, plus GD659 and GD246. The stars have a wide range of effective temperature, 32,800K to 61,200K, to minimize potential systematic errors in the calibration arising from uncertainties in the model parameters for individual stars and from uncertainties in the line broadening theory. The derivation of the effective area calibration is described by Dixon et al. (2007). In this section the internal consistency of the final calibration is tested by comparing the spectra of each of the stars against their respective synthetic spectra. For this exercise, all data were re-reduced with CalFUSE 3.2.2 and new synthetic spectra were computed. The atmospheric models were computed in NLTE with TLUSTY 200 (Hubeny & Lanz , 1995), using the model parameters from Dixon et al. (2007) shown in Table 7.5. The models were computed using 200 depth points, and the Lyman line profile calculations employed the tables computed by Lemke (1997). Synthetic spectra were computed with Synspec 49 (Ivan Hubeny, private comm.). The spectra were normalized to the V magnitudes shown, and shifted to the appropriate absolute velocity. Absolute velocities were taken from the literature, or determined from fits to narrow photospheric lines in the FUSE spectra. GD 71 32,843 7.783 13.032 30. GD 153 39,158 7.770 13.346 20. G 191-B2B 61,193 7.5 11.781 26. All LWRS observations providing usable data were included. Spectra from individual exposures within an observation were normalized to the exposure with the peak flux in that observation; those with less than 40% of peak were discarded. Exposure times were scaled by the inverse of the normalization factor. No other re-normalization was performed. Spectra were co-aligned to place interstellar lines at known absolute velocities, and were combined by weighting by exposure time. 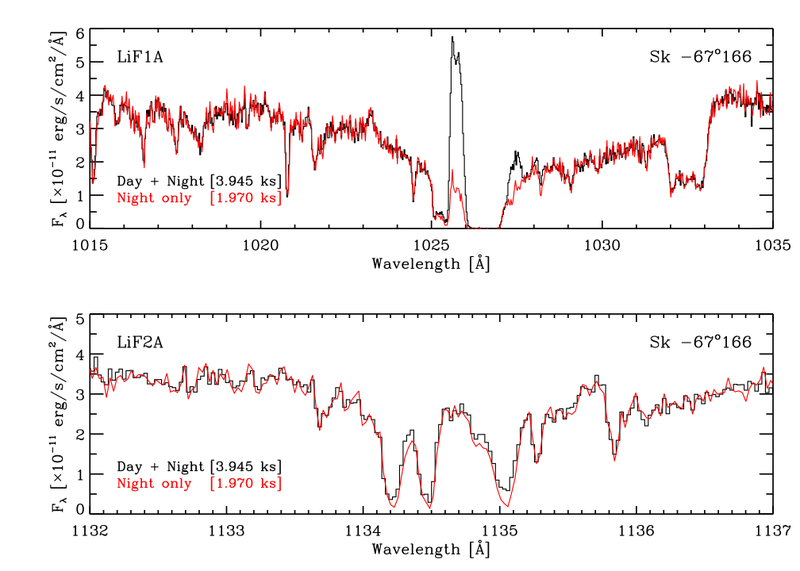 The worm feature in LiF1B is obvious in all the spectra, and shows significant effects throughout the LiF1B band. Because this feature is strong and variable, neither the absolute flux level nor the continuum shape is reliable in LWRS LiF1B data. The effective temperature of the GD246 model is clearly too low. If the parameters from Finley et al. (1997) are used, Teff=58701K and logg=7.807, the agreement between the model and FUSE spectrum is similar to that of G191-B2B. A plot comparing this model with the MDRS spectrum of GD246 is shown in Figure 7.24. The source of this disagreement is still under investigation. The Lyman line profiles in the models appear to be systematically deeper than the data for Lyman γ, δ, and ε though not for Lyman β. There is a worm present, intermittently, in LWRS SiC1B spectra that affects wavelengths longward of about 975Å. It appears prominently in the GD659 spectrum, but weakly or not at all in the other spectra. 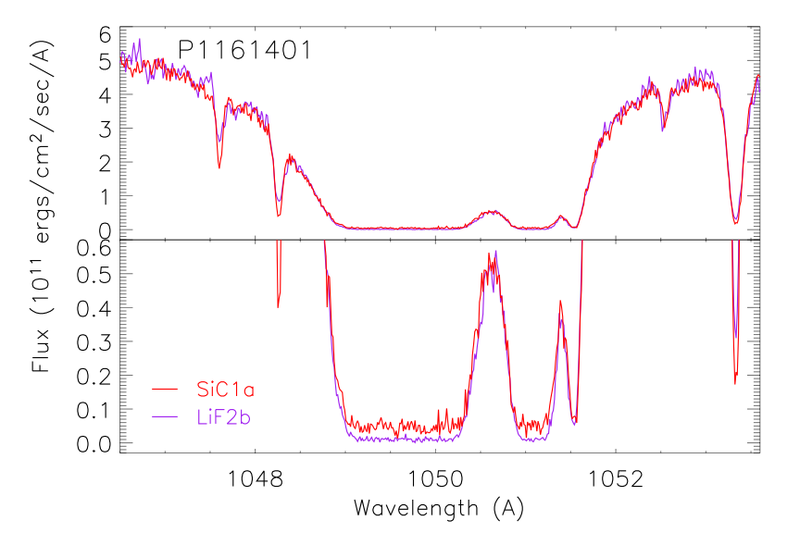 The strength of such features depends sensitively on the position of the star in the spectrograph aperture, so users should compare the SiC1 data at these wavelengths with SiC2, LiF1, and LiF2 data to assess its quality. 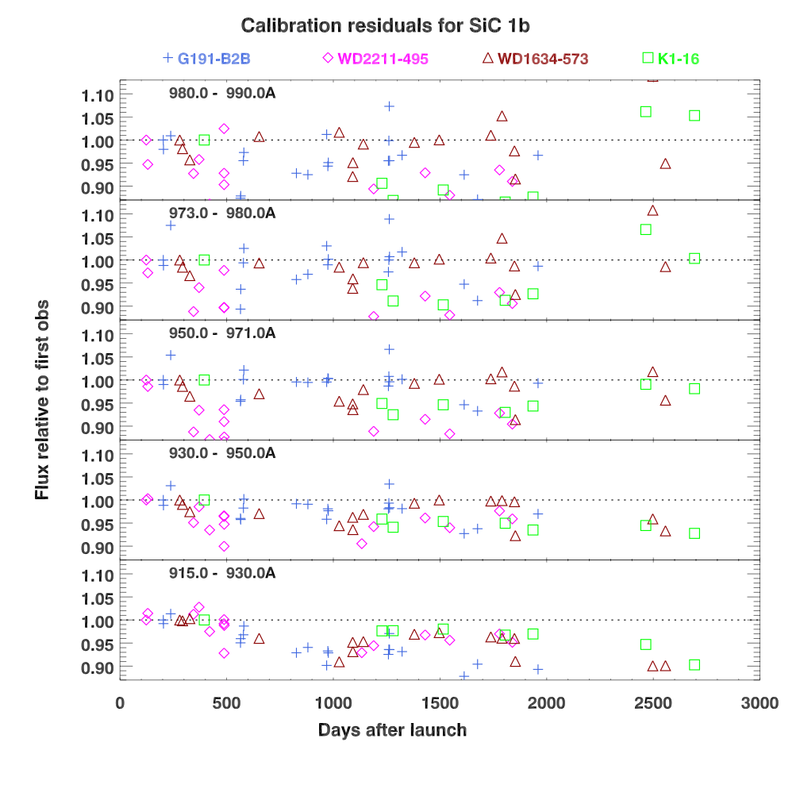 The SiC1 calibration appears systematically low in the GD153 data, and to a lesser extent in the GD71 data. This illustrates the magnitude of the uncertainties that may be present in the corrections for time-dependent variations in the effective area; these are discussed in the next section. There is a broad, systematic bump in the LiF2A effective area apparent in the GD659 spectrum and in some of the individual observations of other stars. This is a manifestation of the shortcomings in the time-dependent corrections for the LiF2A LWRS effective area. This portion of the detectors accumulated the highest cumulative exposure, and the high voltage on segment 2A could not be raised much to compensate. The magnitude of this effect proved difficult to track over time, however, perhaps as a result of dependence on position of stars in the spectrograph aperture or perhaps as a result of weak worm features. The magnitude of the variation of this effect is discussed in the next section. Figure 7.10: Top: The FUSE spectrum of GD 71 is plotted in the upper figure, along with the synthetic spectrum (see text). Al l LWRS observations have been combined; data from each channel are color-coded as described below. The bottom panel in each figure shows the ratio of the data to the model. The lower figure provides the same information for GD 659. In all panels, the red trace represents LiF1, the brown trace represents LiF2, the purple trace represents SiC1, and the majenta trace represents SiC2. The model spectrum is plotted in green. Figure 7.11: Same as Figure 7.10 above, but for GD153 (Top) and HZ43 (Bottom). Figure 7.12: Same as 7.10 above, but for GD246 (Top) and G191-B2B (Bottom). Quasi-molecular satellite lines of the Lyman lines have long been known to be present in the spectra of cool DA white dwarfs (Allard et al. (2004a); Allard et al. (2004b), and references therein). It was not expected that such features would be present at the high effective temperatures of the stars used in the FUSE calibration, and such features were not included in the synthetic spectra used to define the FUSE calibration, nor in the models plotted above. However, a close examination of the GD71 spectrum revealed some weak systematic discrepancies with the model that suggested that such features might be present. Lyman β profiles were calculated for effective temperatures of 30kK, 40kK, 50kK, and 60kK, and Lyman γ was calculated for 30kK (graciously provided by Nicole Allard). The models for all of the stars were re-computed using these profiles; results for a subset of the stars are shown in Figs 7.13 through 7.15. Inclusion of the quasi-molecular features has two effects on the model spectra: isolated absorption features appear at a number of wavelengths, but the overall Lyman line absorption is increased as well. An examination of the GD71 spectrum shows that this overall broadening improves the match to the data at 960Å, and the isolated absorption features between 990Å and 1000Å appear as a significant flattening of observed spectrum. The features at 1055Å and 1075Å are broader and not clearly present in the data. For the somewhat hotter star GD659 the isolated features are weaker-still, and are difficult to discern in the data. 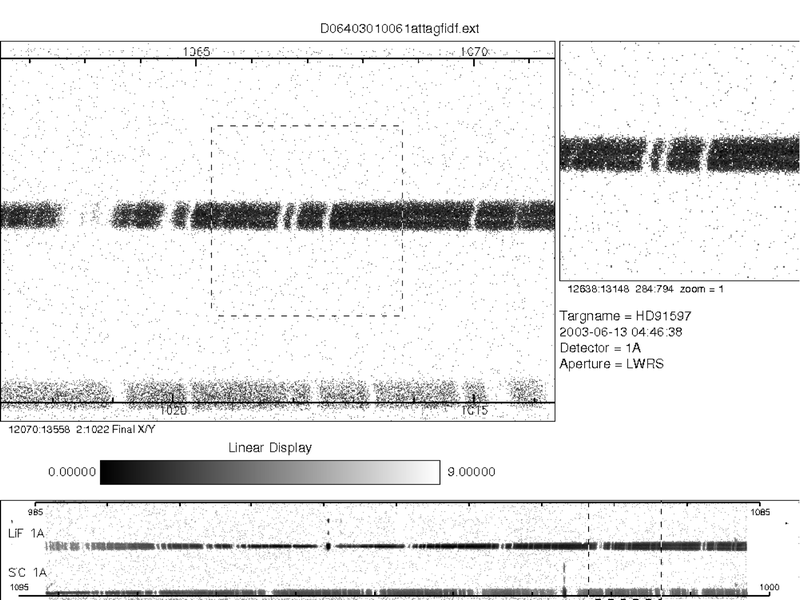 Figure 7.13: A zoomed-view of the spectrum of GD71 is shown, as in Figure 7.10 above. The synthetic spectrum computed using Allard's line profiles is over-plotted in blue. The Lyman β, γ profiles appear too broad (see text), but the discrete absorption features do appear in the spectrum. Figure 7.14: A zoomed-view of the spectrum of GD659 is shown, as in Figure 7.13 above. The quasi-molecular satellites are too weak to be apparent at this higher effective temperature. Figure 7.15: A zoomed-view of the spectrum of HZ43 is shown, as in Figure 7.13 above. The discrete quasi-molecular features have essentially disappeared at this temperature, but the Lyman β and Lyman γ profiles are still measurably broader than in the nominal model (see text). The plot of the HZ43 spectrum and model shows that the broadening of the Lyman line profiles by the quasi-molecular satellites is present even at high effective temperature. Because such effects were not expected at high effective temperature, no systematic testing or tuning of the models has been done under these conditions. The broader Lyman lines predicted by these models appear to conflict with the data, but this conflict may be a consequence of the fact that the calibration was defined by models that did not include such features. Ideally, the calibration would be derived with both sets of models, and the best one selected by testing against a wide range of DA spectra. Such an analysis has not been performed. As a result, there are minor additional systematic uncertainties of several percent in the FUSE flux calibration in the vicinity of Lyman β, which gradually decrease for the higher Lyman series lines. The star G191-B2B has long been known to contain a significant quantity of heavy elements in its photosphere. These trace elements have a dramatic effect on the emergent spectrum at EUV wavelengths (Dupuis et al. (1995)), but weak absorption features are numerous at FUV wavelengths as well. Despite this, pure hydrogen models have been used successfully for calibration purposes (e.g. Bohlin (2000)). The neglect of these lines will result in an underestimate of the effective area at FUV wavelengths. This can be seen in Figure 7.16, which shows a region of the FUSE spectrum in which nearly half of the pixels are affected by weak absorption lines. Figure 7.16: A zoomed view of a small region of the spectrum of G191-B2B is shown, illustrating the presence of numerous weak metal lines. Over half of the pixels shown are affected by absorption amounting to several percent of the continuum. The sensitivity of FUSE varied significantly throughout the mission. Plots of the effective area in each channel are shown in Figs. 7.17 and 7.18. The curves shown in these plots are the effective areas taken from the CalFUSE calibration files. These were derived at roughly 3-month intervals from Launch through late 2004. After that time, while FUSE was operating with only a single reaction wheel, it was difficult to schedule observations of the stars used for monitoring the calibration. The last three curves were obtained in 2006 and early 2007. 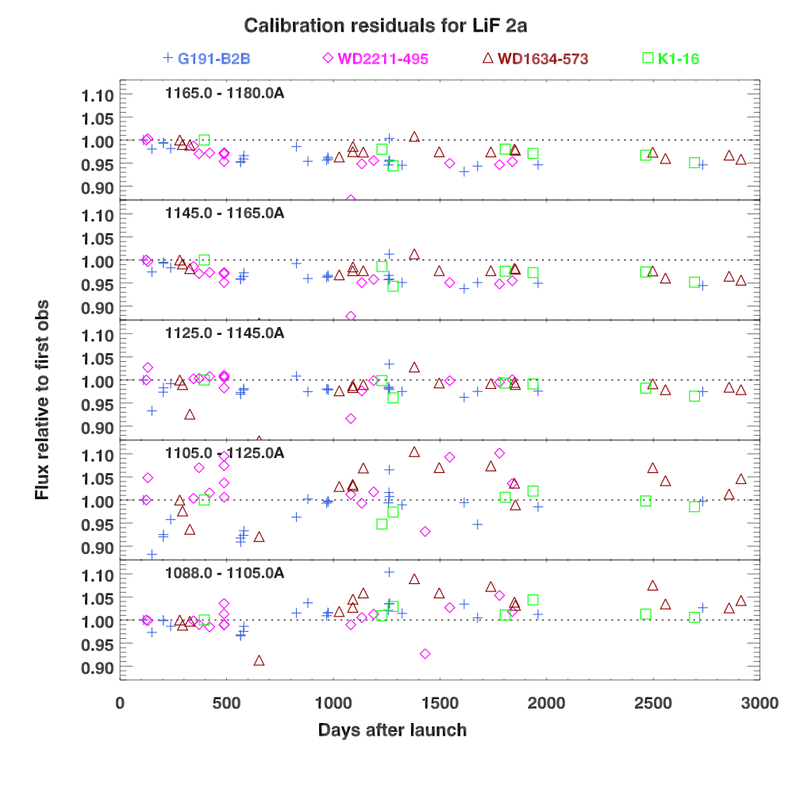 Figure 7.17: The effective area of the LiF1 channel through the LWRS aperture is shown in the left panel; each curve represents a different time during the mission. The dramatic drop shortward of 1000Å is caused by the decrease in transmission of the LiF layer applied to protect the Aluminum coating. The right panel shows the evolution of the LiF2 channel sensitivity. The sensitivity of LiF2B is substantially less than LiF2A, due to the low QE of the MCPs in detector 2B. Figure 7.18: The effective area of the SiC1 and SiC2 channels through the LWRS aperture are shown in the left and right panels, respectively; each curve represents a different time during the mission. The sensitivity of SiC2B is much less than that of SiC2A due to the low QE of detector 2B. A number of features of these plots are worthy of note. The LiF channel sensitivity drops abruptly shortward of 1000Å, but does not go to zero. Significant throughput is present to the point where the edge of the detector cuts off the spectra. The throughput of the SiC channels degraded steadily throughout the mission, while the throughput of the LiF channels stabilized after an initial decline. Because the worm in LiF1B LWRS is both strong and highly variable, no wavelength-dependence to the evolution in sensitivity could be derived for this channel-segment combination. Instead, a simple scale factor was applied to adjust the effective area over time. Similarly, it was difficult to determine a consistent solution for the wavelength-dependence of the LiF2A sensitivity evolution. It too was approximated by a time-dependent scale factor. The reason for this difficulty was not clear, but perhaps the worm features in this portion of the detector were also variable, though not nearly as badly as LiF1B LWRS. Further information and images of the worm features in each detector segment can be found in Section 4.3.4 of the Instrument Handbook (2009). Three stars were used for tracking the instrument sensitivity during the first several years of the mission: G191-B2B, WD2211-495, and WD1634-573. These stars were chosen because they were stable, at convenient locations on the sky, and bright enough that sufficient signal-to-noise could be obtained in brief observations. After the loss of reaction wheels limited access to much of the sky, K1-16 was added to the sensitivity monitoring program. Other white dwarfs provided occasional additional datasets for this program, but these four stars were the primary targets. An assessment of the accuracy of the time-dependent flux calibration was performed in the following manner. All the LWRS data for these four stars were reduced in the same manner as described above in Section 7.5.1. For each observation, the mean flux was calculated for wavelength bins of 15-20Å, giving five bins per channel and detector segment. The ratio of each such average flux to that of the first observation of each star was computed; the results are plotted in Figs. 7.19 through 7.22. Splitting each spectrum into these broad bands helps check for potential systematic errors in the overall slope and to detect the influence of worm features. Figure 7.19: This Figure shows the variations in LWRS LiF1 response over the course of the FUSE mission, as determined from relative changes in measured fluxes for the four primary monitoring stars. Each panel shows the variations for a 15-20Å portion of the spectrum. LiF1A is shown in the Left panel: the tight clustering of ratios about unity shows that the variations in sensitivity were well-corrected for LiF1A. LiF1B is shown in the Right panel: the wide scatter of points for four of the five spectral bins is due to the strong worm in LWRS LiF1B. Figure 7.20: Same as Figure 7.19 above, but for LiF2A and LiF2B. Figure 7.21: Same as Figure 7.19 above, but for SiC1A and SiC1B. Figure 7.22: Same as Figure 7.19 above, but for SiC2A and SiC2B. 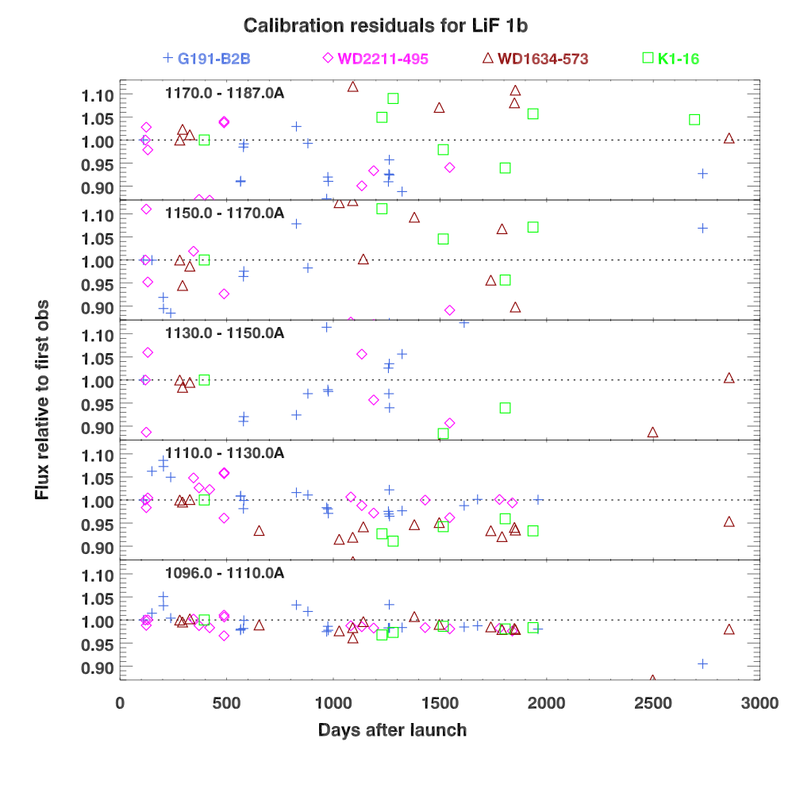 The calibrations of the MDRS and HIRS apertures were performed in the same manner as for LWRS. These apertures were never intended to produce accurate absolute fluxes, but in practice the MDRS aperture did often produce spectra of good photometric quality. Variations of the channel alignment on orbital time scales often resulted in lost flux, especially for the SiC channels. However, an examination of the count rates during an observation would often permit determination of the true absolute flux. Because the HIRS and MDRS apertures were used much less often than LWRS, the regions of the detectors illuminated by these apertures suffered less degradation over the mission. Apart from localized areas "burned-in" by geocoronal emission lines, the predominant cause of change in sensitivity was degradation of the optics. As a result, the corrections for time-dependence of the instrument sensitivity derived for LWRS should provide reasonable results for MDRS and HIRS. 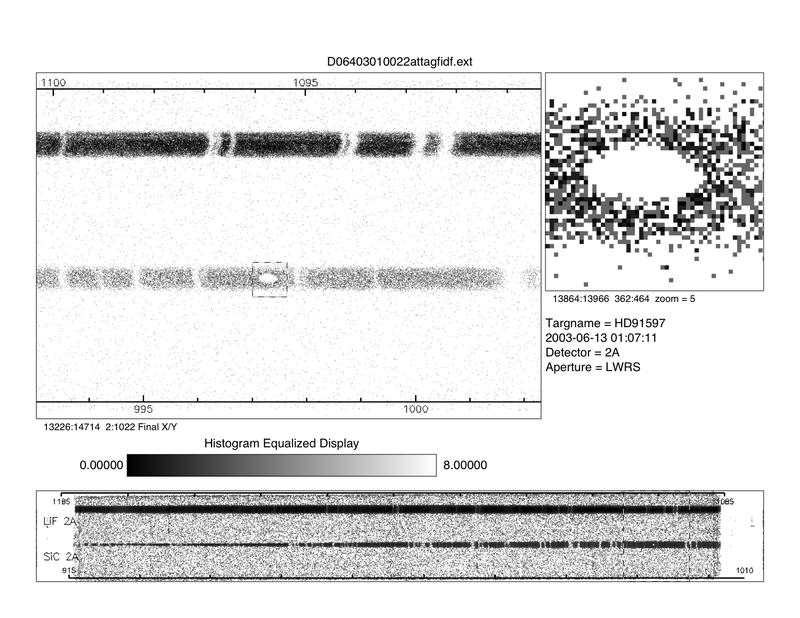 Figures 7.23 through 7.25 show the MDRS spectra of HZ43, GD246, and G191-B2B. The data were reduced in the same manner as described for the LWRS data in Section 7.5.1. There were enough individual exposures of these stars so that there was at least one that was close to photometric in each channel, with the result that the overall normalization turned out to be close to correct. The exception was LiF1B for GD246 and G191-B2B, which was off by about 10% in both cases. 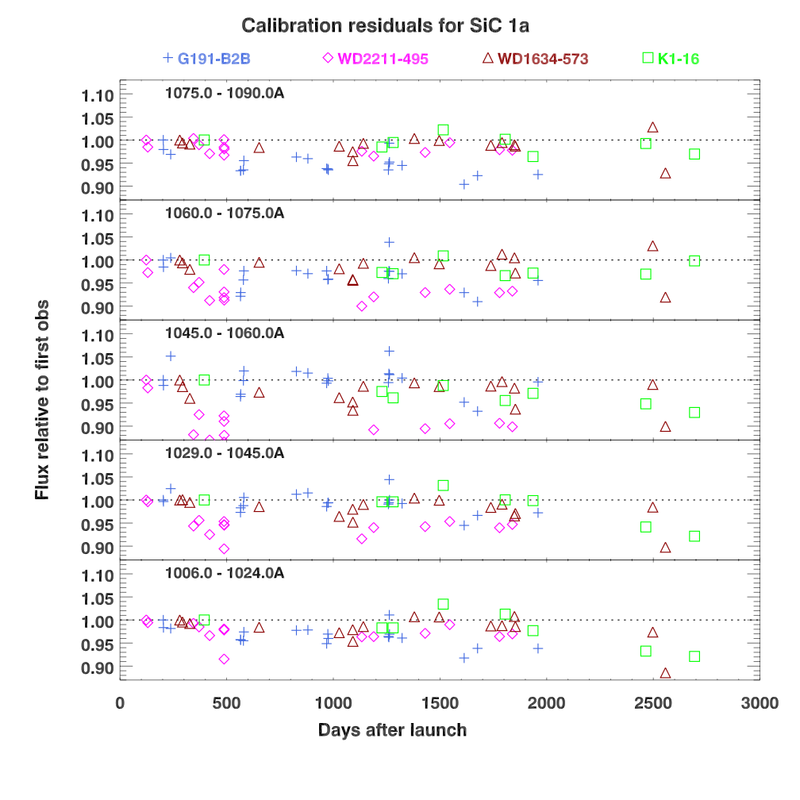 The shortcomings in the corrections for time-dependence of the LiF2A calibration are evident in the the G191-B2B spectrum: this spectrum is dominated by data obtained early in the mission, so the initial high throughput at 1095Å - 1135Å manifests itself in a measured flux that is too high by 5-10% at these wavelengths. Figure 7.23: Same as Figure 7.10 above, but for the MDRS spectrum of HZ43. Figure 7.24: Same as Figure 7.10 above, but for the MDRS GD246 spectrum. The synthetic spectrum shown here was calculated with Teff=58,700K and logg=7.807 rather than the parameters shown in Table 7.5. The overall agreement in the shape of the spectrum is much better than that shown in Figure 7.12 for the nominal parameters. Figure 7.25: Same as Figure 7.10 above, but for the MDRS spectrum of G191-B2B. The holographic diffraction gratings should have significant efficiency in second and higher orders, and the detectors should have good QE at EUV wavelengths, so the FUSE instrument may have substantial sensitivity in second and higher order. Such sensitivity is limited by the low reflectivity of the coatings in the EUV, but it cannot be assumed to be negligible. Indeed, geocoronal emission of He I 584Å is often seen in second order at 1168Å for observations of faint sources during orbital day. The high-order throughput of FUSE has not been calibrated, but some estimates can be made. The second-order bandpass for the SiC channels spans 450Å-550Å. The reflectivity of SiC is typically just over 30% in the FUSE first-order bandpass, declining gradually with decreasing wavelength. At shorter wavelengths the reflectivity drops more steeply, reaching about 10% at 584Å, 5% at 522Å, and ~2% at 460Å. These values were obtained from pre-flight measurements of witness mirrors coated along with the FUSE optics, and are consistent with other SiC mirrors (see Kruk et al. (1999) Fig. 14 for the HUT primary mirror reflectivity). Thus, in the SiC channels the FUSE second order sensitivity will be a factor of 20 - 100 lower than in first order. For solar system objects, this might still yield useful throughput. Beyond the solar system, the most likely candidate to be affected might be HZ43, where the combination of high Teff and low H I column density gives a fairly high ratio of 550Å to 1100Å flux. However, even here the number of detected second-order photons is likely to be no more than a few percent of the first-order photons. This is likely to drop quickly with decreasing wavelength. The second-order bandpass for the LiF channels spans 490Å-590Å. Pre-flight measurements of the LiF witness mirrors gave reflectivity similar to the SiC mirrors at 584Å, but which dropped off more slowly, to a somewhat higher value of ~ 5% at 460Å. Because geocoronal HeI 584Å emission is seen in the LiF channels, this opens up the possibility that there might be useful second-order throughput at shorter wavelengths. One of the likely applications for second-order sensitivity would be to use the HeI ionization edge at 504Å for studies of the local ISM. However, a preliminary examination of the cumulative HZ43 and G191-B2B spectra described above revealed no apparent evidence for this feature. A careful analysis might be able to extract a weak signature from these observations, but it is clear that the second-order sensitivity is too low for this to be generally useful in FUSE archival data. 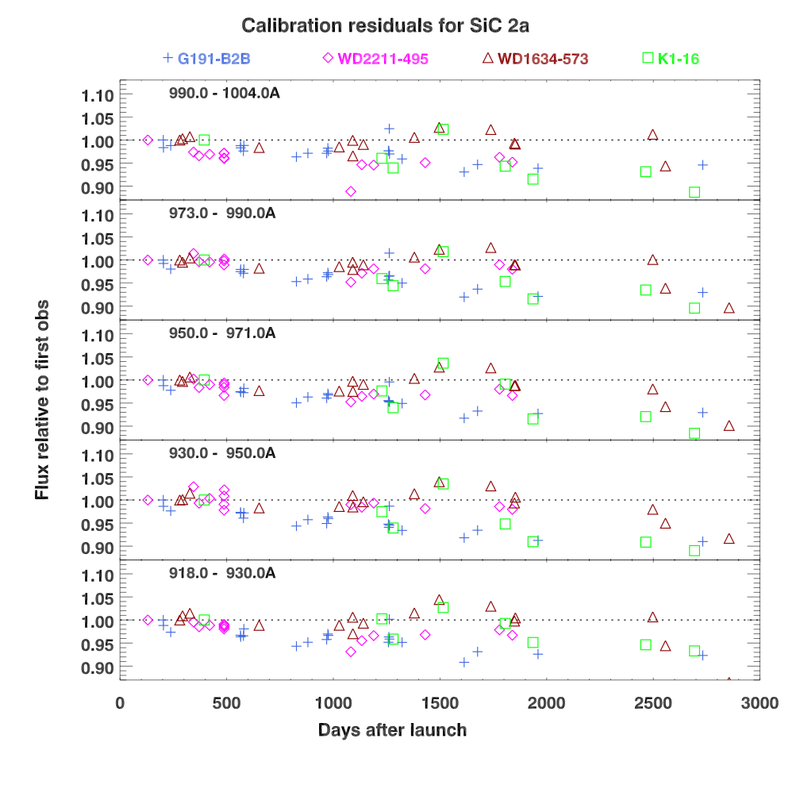 Errors in the wavelength calibration were measured by comparing the positions of interstellar absorption features in the spectra of white dwarf stars with those of synthetic spectra. For spectra rich in H2 features (program M107), the wavelength solution could be sampled on sub-Å scales across the FUSE bandpass. In general, the wavelength errors were found to be quite small. 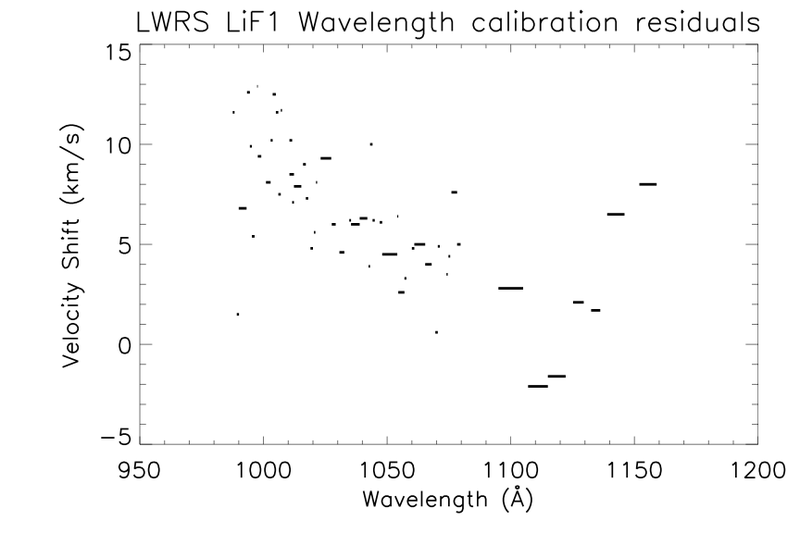 Figure 7.26 shows the residual wavelength errors in the LiF1A spectrum of the white dwarf KPD 0005+5106 observed through the LWRS aperture. This star was observed a number of times throughout the mission. The data from each observation were reduced independently. For each channel (LiF and SiC), detector segment (1A, 1B, 2A, and 2B), and aperture (LWRS, MDRS, and HIRS), all available spectra were shifted to a common wavelength zero point and combined into a single spectrum. The spectral-fitting routine Owens (Lemoine et al. (2002)) was used to fit an interstellar absorption-line model to each of the resulting spectra. The fitting windows were repeatedly divided into smaller wavelength intervals until the offset between the model and the data for each line in a window was less than half a pixel. Some windows were several Å wide; others encompassed a single line. 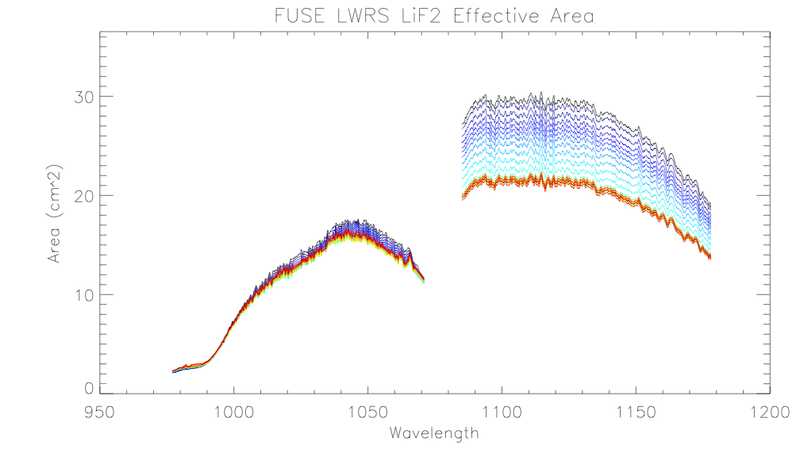 The wavelength shifts necessary to align the LWRS LiF1 spectrum with the model are plotted in Figure 7.26. Several features seen in this plot are repeated in those for other channels and apertures. 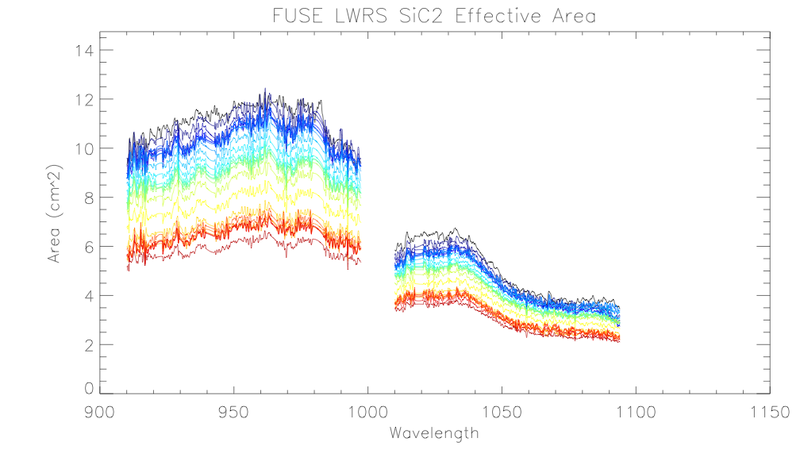 Similar residual plots for the LWRS LiF2, SiC1 and SiC2 channel, as well as for the HIRS and MDRS apertures can be found in Appendix F. We typically see a linear stretch in the wavelength scale of approximately 10 km s-1 over an entire detector segment, particularly near the ends of the detector. On smaller scales, local distortions of 4 to 5 km s-1 (about one 0.013 Å pixel) over scales of a few Å are common. Such small-scale variations are impossible for the pipeline to correct. When fitting features occurring throughout the FUSE bandpass, it is therefore recommended that the users divide the spectra in small windows of 1-3 Å allowing for the line centers to vary in order to correct for those small-scale deviations to the wavelength solution. 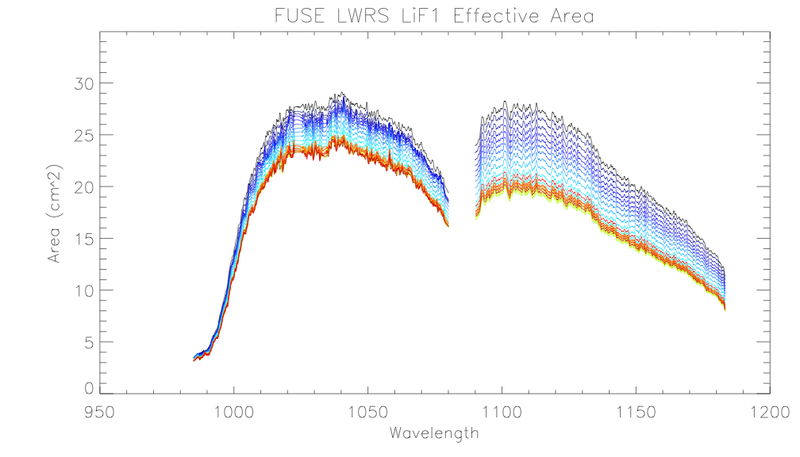 Figure 26: Residual wavelength errors in the LiF1 spectrum of the white dwarf KPD 0005+5106 observed through the FUSE LWRS aperture. Horizontal lines represent the width of a window over which wavelength errors differ by less than half a pixel. The FUSE resolving power ranges from ∼15000 to ∼20000. Because of the combined effects of target motion, gain sag and astigmatism, the point source resolving power of FUSE data can in principle vary between observations and from exposure to exposure within a given observation and is wavelength-dependent. Since CalFUSE applies a correction for these effects to each photon in the event list for TTAG data (unlike HIST data), TTAG data will always exhibit a slightly higher resolving power than HIST data obtained with the same aperture. These same effects render the FUSE point-spread function (PSF) and the FUSE line-spread function (LSF) variable as well. Under most circumstances, a Gaussian LSF corresponding to R = 20,000 provides a reasonable representation of the FUSE LSF. At high signal-to-noise, the LSF in the SiC channels is better represented by two gaussians, with a narrow component corresponding to R = 20,000 and a broader component with extended tails; see Kruk et al. (2002) and Wood et al. (2002) for details. The LSF in the MDRS and LWRS apertures is expected to be slightly asymmetric even afterastigmatism corrections are applied; however this asymmetry is only apparent and significant at signal-to-noise of 30 and above. The resolving power is discussed in greater detail in the Instrument Handbook, Section 4.3.1. The background sensed by the FUSE detectors is thought to be composed of three distinct components: Detector background, stray light that enters the spectrograph from outside the nominal optical path, and scattered light from the far wings of the grating PSF (see Section 7.6). For TTAG data, CalFUSE ignores the light scattered by the grating and assumes that the observed background consists of three independent components: 1) a spatially uniform dark count; 2) a spatially variable day component, and; 3) a spatially variable night component. Thus, for TTAG data, it fits unilluminated portions of the detector to a model for these three components. However, when the observed background is poorly defined, CalFUSE assumes that the uniform component equals the dark-count rate scaled by the exposure time and fits the day and night components. No model fit is performed for HIST data or TTAG data with very bright backgrounds, e.g., from nebular emission. Instead, the day and night model components are scaled by the day and night exposure times, and the dark-count rate is scaled by the total exposure time to produce the model background image. This scheme is adequate for HIST observations because they are typically short exposures of bright targets, making the background relatively faint. More details can be found in the Instrument Handbook (2009) and Dixon et al. (2007). NOTE: A few items must be noted about the CalFUSE background correction. First, grating scattering along the dispersion direction is not taken into account. This can be significant, being as much as 1-1.5% of the continuum flux in the SiC channels but 10 times less in the LiF channels. Second, CalFUSE treats uncertainties in the background as systematic errors and does not include them in the (purely statistical) error bars of the extracted spectra. Third, as discussed by Dixon et al. (2007), there are shortcomings in the FUSE background model. Specifically, some portion of the uniform component may actually be due to scattered light, and temporally variable. As a consequence, the model fit can over estimate the background (for possible solutions see Dixon et al. (2007). Typical diagnostics that suggest improper background corrections are flux levels systematically below zero, and, contrarily, fluxes systematically above zero in regions expected to be at zero (e.g. saturated absorption lines). One way to increase the fidelity of the background correction is to increase the signal-to-noise of the background sources by adding several IDF files before applying the background correction. Tools to accomplish this are discused in Chapter 8. It is also instructive to examine the discussion of background corrections given by Grimes et al. (2007), in their search for Lyman continuum emission from star-forming galaxies at low redshift.